Downloaded, printed, and displayed in Dept for International Trade! I loved these when I worked in 2MS and I'm glad you've shared them. Thanks Darren. Glad you liked them. Thanks Simon. We'll be adding more to the series. Glad you like them. It's been a hugely collaborative effort with our team here at Home Office Digital. These posters look excellent - most timely. I have already shared these with some of my colleagues. Hi Michael, appreciate your points. 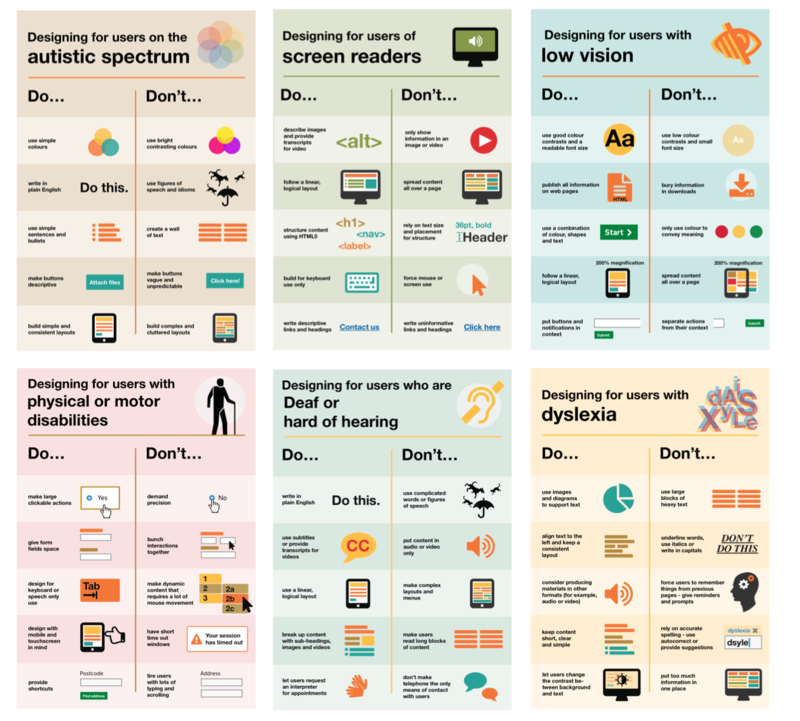 Apologise if this wasn’t made clear but we present these posters for general guidance; however, it is worth testing these design principles with users to ensure we get the right balance and make compromises where necessary as what may work for some may not work for others. No worries. If you can move the images off GitHub it would be much easier to see the content. Also, from my perspective it's worth speaking to the folks at TFL for good accessible mobile websites - GOV.UK has become text heavy and really difficult to navigate. Hi Michael, we've provided additional links to view each poster now towards the end of the blog post. Hope that helps. As Michael indicates, there is a difference between meeting regulatory accessibility guidelines (US: Section 508 refresh & WCAG 2.0) and meeting the needs of disabled [adult] learners. Simple example pointed out to me by a screen reader user... at the end of a text-only accessible document (typically HTML5). add an H2 Header that indicates End of Document. His best advice though: Download a trial version of JAWS, arrow through the content page by page, and listen to your content before you publish. Very useful, thanks. Small thing, I think there's a typo in the "What the posters say" section. "let uses as for an interpreter when booking appointments"
As a blind person, I am really pleased that all this is being publicised. However, it should have been proofread and typos removed before making it public. "make button vague" should be "make buttons vague"; "image of video" should be "image or video"; "use a liner" should be "use a linear,; "layouts and and menus" should be "layouts and menus". Keep up the good work though. We've made the corrections, thanks for letting us know. Will these posters be available in Welsh? We can't use them, put them up or promote unless we have in both languages as per Welsh language legislation. In the GitHub link, we've provided a Sketch workfile that you can download and use so the posters could be translated into different languages. Hope that helps. We've gotten lots of requests about translating them to other languages. We'd really appreciate (if you can) to commit the translations to our repository so they're available there for everyone. These look great and so useful - thank you for creating them! Would there be a problem with using them on HS2 Ltd's internal communications pages? 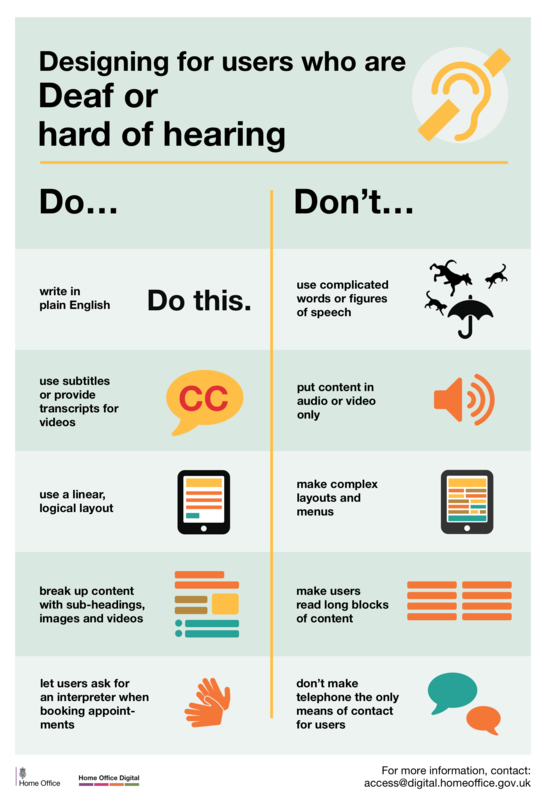 We're doing a visibility push around accessibility in comms in December, and these would be a great resource to share. Yes, please feel free to use them. We want these to be shared as much as possible. It'd be great to see some photos of the posters, in action! tthese are great, many thanks. Can I encourage you to develop one that specifically considers people who navigate their computer with voice recognition software,, as I do? Great idea Nicky. Do you have any particular recommendations that you would want included? I want to deploy the language of various countries. We have a Sketch workfile on GitHub that can be used to reversion the posters into different languages. We're currently looking to create them in another source file for all users. We'll let you know once that's done. Appreciate your interest in these! I'd love to see the research your team has done that led to these wonderful posters. Specifically, the work done to optimize for hard of hearing users. Are there links to studies? Thanks! I'd like to add a do/don't to many, concerning animation, sliders and moving text: provide a way to pause them and navigate them manually. This is important to limit distractions, and to accomodate those who cannot take in the information of the animation / slider / moving text at the pace it dictates. This may be true for low vision users, users on the autistic spectrum, users with dyslexia and users with motor disabilities, and also users with cognitive impairments. Appreciate the feedback Inca. We can feed this into future iterations of our posters. Glad you like them, thanks Bart. Nice posters. They'd be even nicer if you went one more step and made the PDF files accessible (ie, tagged pdf). Visually, they look like tables so you could tag them as tables. Or you could tag them as bulleted lists like you did in this article. I should have started off by saying 'thank you' for working on accessibility rather than going right into my suggestion. Quite rude, sorry. No worries Glen. We've received quite a lot of attention on these posters and are aiming to make them as accessible as we can . Tagging the PDFs will be the next thing we look to improve. Many thanks. This may SEEM to chime with "write in plain English" - but it doesn't actually help. 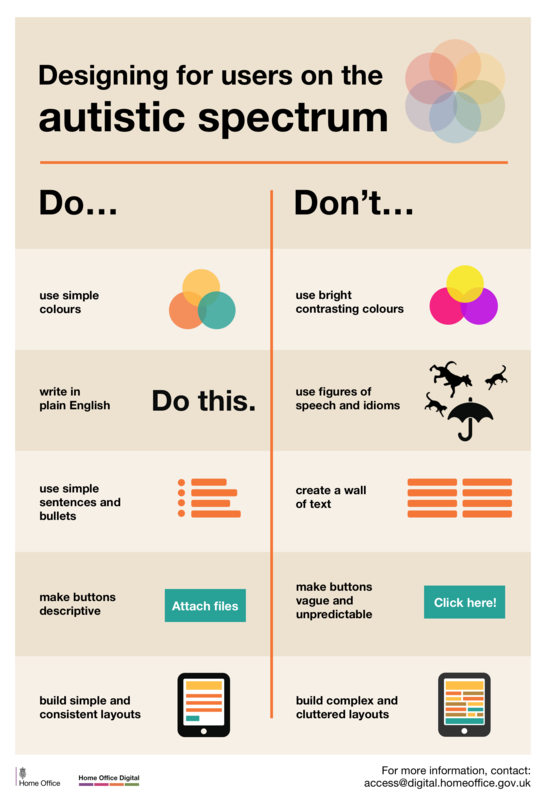 Autistic spectrum people tend to take things literally. Euphemisms (or over-simplified icons) can be not understood. So things need to be familiar - not in code (hence plain English) - but this also means that realism (or skeumorphism) is better than unrealistic "flat" - so shading and depth are preferable to bright "Fisher Price" colours. ii) "Don't ...." use flat monotone icons - absolutely, so why are there so many around? iii) Use bullets not text blocks. Absolutely - so why so few lists of Contents ? These help provide context and info in a quick to read, user-friendly fashion. iv) Buttons SHOULD be descriptive - so what is wrong with "click here". It tells the User exactly what to do. Doubt arises if the text alongside is unclear - or the "button" doesn't look like a "button" but a plain slab with plain text instead - like "Attach files". v) "Yes" to simple layouts rather than the jumble shown to the right - but distinct panels and columns for Contents, themes or functions all in one view are preferable to a single column that has to be scrolled. Why ? Because context is best assimilated all together rather than relying on memory as content/navigation scrolls out of view. Hi Jules, many thanks for your feedback. Regarding your point on buttons, while "click here" do literally tell the user what to do, what we were aiming for was to explain that the words were unclear as to indicate what will happen next once that button is clicked. However, your other suggestions, including the one on skeumorphism and coordinating layouts so memory is not heavily relied upon is duly noted. You've raised some interesting points to consider which can feed into improving and iterating these posters further which is greatly appreciated so many thanks for that. When screen readers are used some users navigate quickly using only the links on the page as navigation "waypoints" to jump to the section they want. If there are 5 "Click here's" on the page (and typically no <alt> text) it can be hard to know which one is the right "Click here". Then you expect the user to listen to a full url to figure out what the destination of that link will be. We found this out by seeing exactly how some blind users navigate pages using a screen reader. Very helpful stuff! By the way, I have one question. Would “hiding in the shadows” be considered a figure of speech? I want to use it in a blog post, but I’m not sure if it would confuse those with autism or other brain disorder. "Hiding in the shadows" can be interpreted literally but it does depend on an individual basis. Someone with high-functioning autism may have a hard time understanding idioms although it won't necessarily affect their basic language skills. Thanks for this great post. I saw a link to it in this week's issue of "Top Tech Tidbits for Thursday." I think you've covered some good tips for screen reader access. Inaccessible CAPTCHA's are a big "no-no" in my books. I am not a fan of audio CAPTCHAs either because people who are deaf/hard-of-hearing cannot use them. I personally have gotten some of the audio ones to work, but if at all possible they should be avoided. We're gathering a lot of useful tips and advice from feedback we've received to feed into future iterations of the posters so really appreciate your feedback. Thanks Jake. Can I translate them into Chinese and forward? Yes. If you can commit the translations to our repository so they're available for everyone. This is an excellent resource. Thank you so much for sharing. I'll definitely be printing them out and putting them up in the office. Thank you very much for these posters. The City of Philadelphia Office of Emergency Management will keep these helpful tips in mind while designing our outreach materials. Great series - have them on my wall at work! 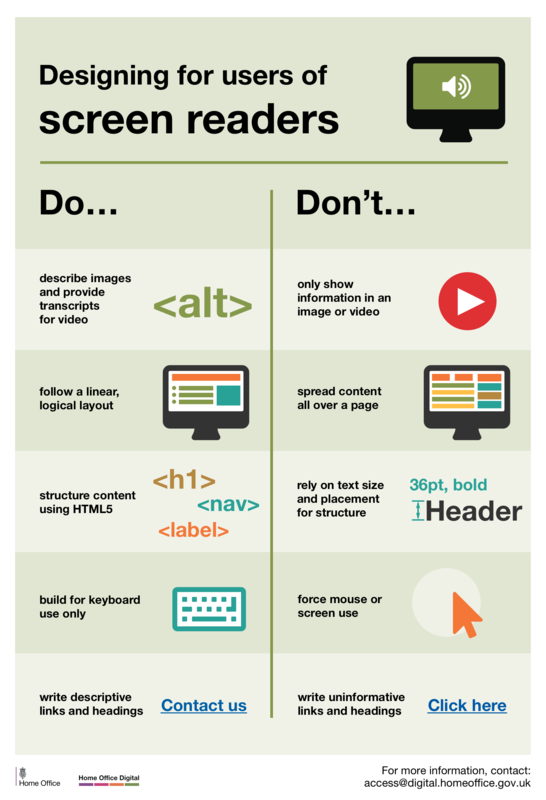 Would love to have seen "don't upload images of text" for the screen readers poster though. 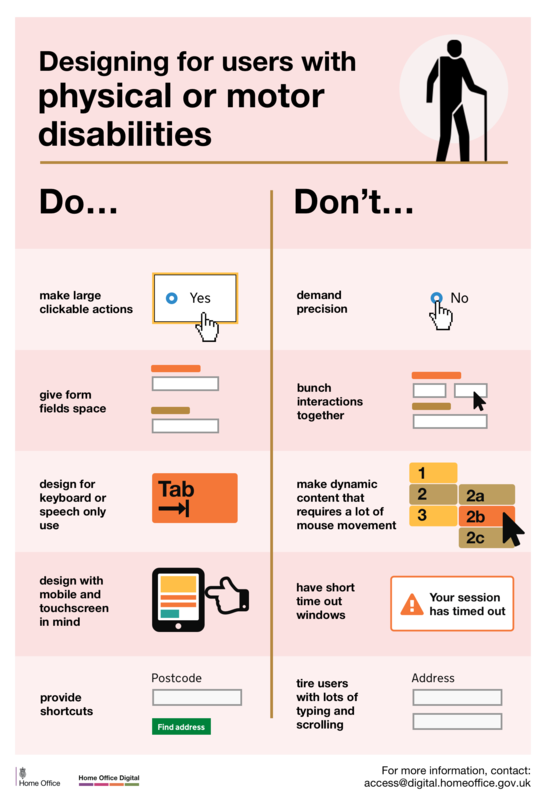 It's something I come across at work a lot, and it's a big no-no for users with disabilities. Hi Lloyd, we're keeping a list of suggestions and tips from everyone for future iteration and next steps with the posters so we really appreciate your feedback. Thank you. This is a really great post. I was expecting a dry list of boring do’s and don’ts. But the way you put it together is pretty good. Thanks! We (the Patient Information Forum) are putting together an event on accessible health information, we'd love to have someone from your team come and talk about your work developing these guidelines and designing accessible digital information. You can contact us at claire.murray@pifonline.org.uk if you'd be interested to find out more about our work and the event. Hi Claire, thank you, glad you found the posters really helpful. We'll get in touch with you soon to discuss your event in more detail. This work is really refreshing and highlights the specific needs of the different users quite accurately. Just a thought, although there are some common issues within the different user groups, people are individuals, so I think the ability to personalise is what will truly enable accessibility. I am the mother of an autistic child and a policy/procurement professional for CCS. I'm personally grateful for these efforts and would like to know how to get involved? These needs are wide ranging and sometimes contradictory across the different types of users. How can a designer meet all these needs for one website? Is there a way to design all the elements for each of the different users and then put them on some sort of overlay? And when say, an autistic person uses the site, they can turn on the design that's meant for them, or a person who is blind can turn on the design suited for them etc..
Or should a designer include as many elements as possible to suit as many different users as possible, and then allow ways for the user to personalise the site to their needs? Thank you for your comments. Regarding your question about how to design to meet all needs, the baseline would be to design in such a way that you’re incorporating as many of the best design practices as possible so that anyone regardless of ability or condition can use your site; from there, you can further personalise the site according to specific needs like customising personal settings or downloading plug-ins and certain software tools which can help. With the posters, we’re currently looking at ways of improving them based on the feedback we’ve received by starting to code them as a site so they can be more responsive and accessible. Some of the approaches we’re looking at is perhaps showing all of the best design practice with the ability to choose those design principles that impact certain users more than others. We’re still thinking about this so your comments on personalisation based on needs has been timely and welcomed. If you’d like to get involved, we’ll let you know soon where you can give feedback and suggestions on our new poster project. Thank you. I'd be interested in helping out with creating a web version of these posters. Let me know if you need any help! Really useful resource, thanks. I plan on printing them out on putting them round the office to make people keep thinking about them. Hm, to me this looks a bit like the same set of best practices that should be followed - not for people with specific needs but for all users - has been inflated to cover 6 different "specific needs" groups. This makes it look again as if accessibility is something we do for handicapped people. It isn't. It's something we do for everybody. And for this reason, I would recommend that we start with a poster that says "For all users:" with the basic best practices (which include, e.g. "write in plain English", "don't use ALL CAPS", etc.). If then there are some aspects left that are only relevant for specific target groups - very well, add a note. But the main theme should be: Accessibility is for everybody! Hi Sascha, thanks for your email. I appreciate and fully agree with your comment that accessibility is for everybody. The posters are indeed good design principles for everyone and are not exclusively for the user groups in the posters. The reason behind creating the posters is to raise the profile of different users in our community and increase awareness of different conditions that people have. We do so by highlighting what good (and bad) design looks like, especially focusing on ones which affect some more than others. So we could create a poster for all users but feel we'd lose the purpose of being able to learn and understand more about the different users that make up our diverse society and in the process, we get to appreciate how good inclusive design makes for good design for everyone. This is amazing. Thanks a lot for putting this together. Any questions, do let us know and we'll be happy to help. I love this effort for so many reasons. I'm not a web designer, but I often manage web designers, and I need to make the case for accessibility to them. These posters will help me do that! I also work for Knowbility, a nonprofit organization that promotes accessible design for online tools. They have a hackathon every year called OpenAIR (http://www.air-rallies.org), where design teams build websites for nonprofit organizations, and work to make the websites accessible using the standards you promote in your posters. 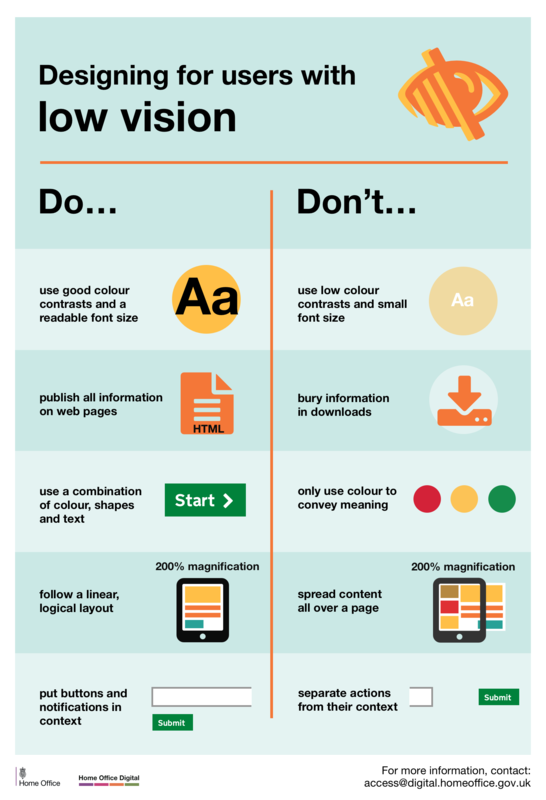 These posters will help me better explain to the nonprofits what the web designers will be doing. As of the moment I'm making this comment, there are still openings for web design teams - would love to have a team (or more!) from the UK participating in this hackathon (it's entirely online!). And, finally, these posters are going to help me in my international work - I have struggled to explain accessibility when I'm working overseas to people for whom English is not their first language. These posters are really going to help me! Very useful post, but the example for providing shortcuts seems like a poor one. In cities with tall apartment developments the number of addresses in a postcode can be so long as to make ONLY asking for a postcode significantly more tiresome in terms of "typing and scrolling" (emphasis on the latter), than (for instance) asking for number AND postcode. I am glad to find such posters. At the moment i am writing a (german) book about accessible PDF, and it would fit perfect, to have the posters inside. Thank you for your comment. We consulted our team and it should be fine to include the posters in the book. Please let us know when the book is out, we'd like to see it as well. We appreciate all the great responses so far. Some guidance on considerations for colour-blind users would be good. 1 in 10 men are colour blind. We've stopped creating any further posters but do feel free to use our template to build one for colour blindness. We're really keen to see what others have done and it would be great to share. 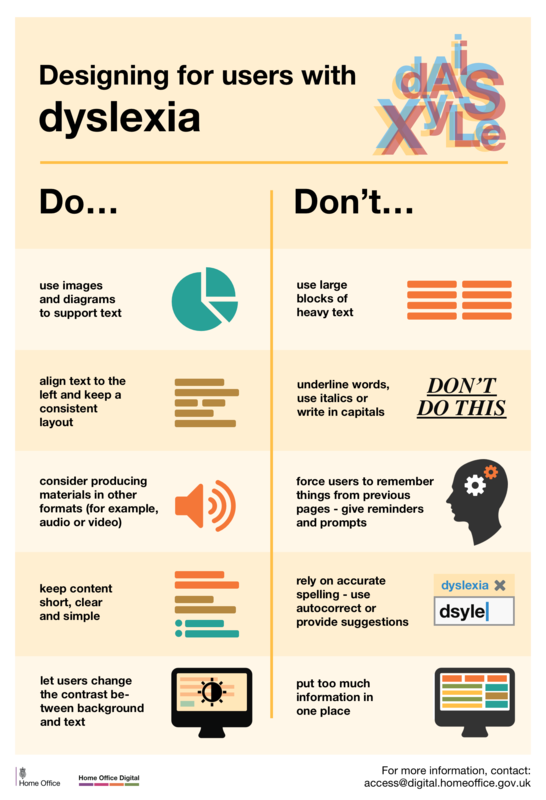 I find the upper right icon for Dyslexia offensive. I don't see blurry or out of focus letters. I tend to see them flipped and have to pause and think -- like b and p or d and q. There are probably others who have different challenges. As a Disability equipment dealer, i would say its really useful resource. Is it okay to hang this as a poster in our office? Yes, you can print and hang these posters in your office. Feel free to share pictures of them on your walls and tweet about them. We'd love to see them.